Christmas is quickly approaching, which means the New Year will be here before you know it. What's your New Years resolution? Mine last year was to drop a few more pounds... which I actually put on about 8 unfortunately. New Years resolutions are usually hard to accomplish, and many of us need a little additional help to achieve them. For those of you who are thinking about quitting smoking yet again, I might have a product that could help you achieve that goal... or at least help you cut back. The company called Nicomate have produced electronic cigarettes, with the choice of disposable or an actual kit that you change the cartomizer. This is a great alternative to the unhealthy, smelly, chemically filled cigarettes that many of you may be addicted to. 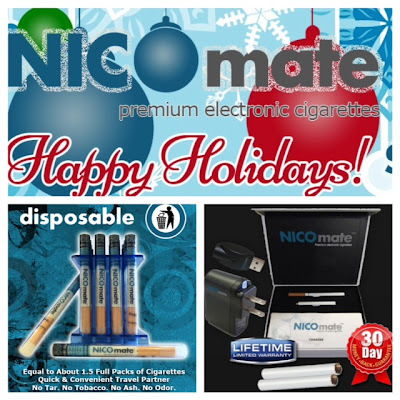 Since Nicomate is an electric cigarette, you're able to use it anywhere that smoking isn't permitted. This helps relieve the craving for that nicotine fit that you're having, which can eventually help you to cut back and possibly quit. Now of course everyone is different, and not everyone will be able to quit using this product... but it does help you on the road to a healthier you. I used to be a social smoker, which was usually when I had an alcoholic drink. I've been smoke free for quite a number of years now... and feeling great. I actually received the disposable version of the Nicomate, and I gave it to my close friend. She's been smoking since her late teens, and we're now in our early 30's. She's actually been able to cut back on her cigarette intake, to only smoking one real cigarette... and controlling most of her cravings with this product. Her goal... to buy the kit and quit in the new year. Do I think she can do it? Hell ya! She's determined to get healthier, and I already notice a huge difference in her mood since the change. Interested in getting your own Nicomate? Of course you are! Click here to visit and grab your items today! 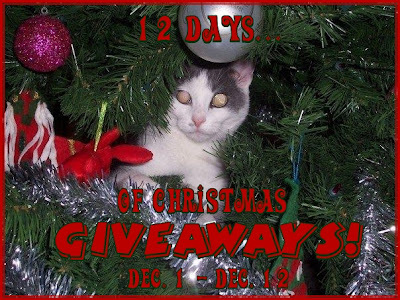 Interested in visiting their Facebook and Twitter pages? Of course you are... you never know when you could save and get a deal! Thanks to Nicomate one lucky reader has a chance to win a Nicomate Starter Kit and Disposable ECig. To qualify you must be 18+, and be a resident of US/CA.